Recently I’ve been seeing many of my friends posting photos of their summer veggies straight out of their gardens. Beautiful, colorful pictures of tomatoes, peppers, zucchinis, lettuce, herbs, and other ready-to-be-picked vegetables makes me so excited, and so impatient, about starting a garden myself. For 15 years I’ve been itching to start a raised garden. The neighborhood I live in prohibits such things. I could start tomato plants in pots, but I don’t want to do that. I’m so OCD about how I want to do things with my future garden that I’m saying NO to planting things in large pots and allowing them to take over my front porch. Alex and I bought an herb kit and unfortunately was unsuccessful. We’ve had so much rain, and there was nowhere for the water to go in those little metal pots that 2 of the 4 herbs got waterlogged and were limping along. The other 2 herbs never sprouted. I even tried planting a new herb in one of the tiny pots and it too never made it. So the lesson here is never buy a $20 herb kit with fake dirt that expands in water, and most likely the seeds are either no good or don’t work well in tiny pots. So again, I continue to wait for my raised garden. My cousin was really successful with her zucchinis this year. Holy moly they were HUGE!! I picked this one to take home and chop up. I could probably make 10 zucchini recipes out of this thing!! The first recipe that comes to mind is the good ol’ zucchini bread. 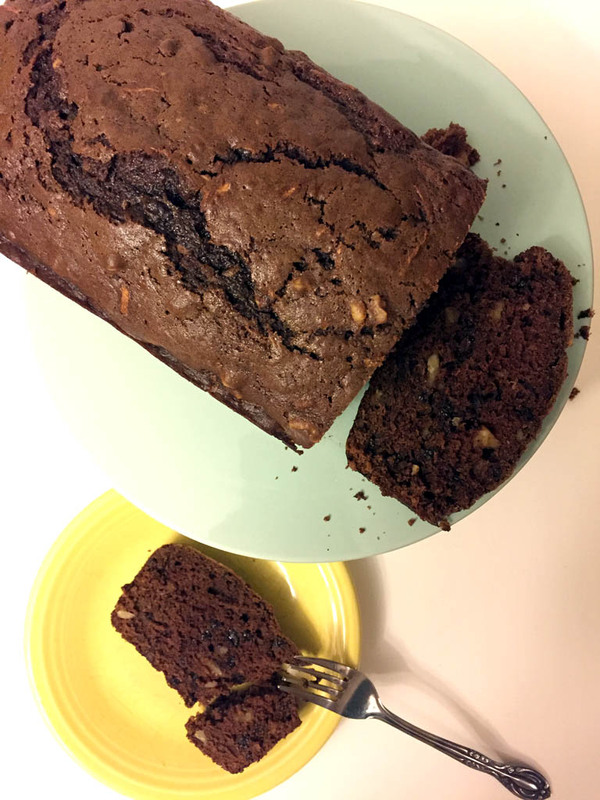 Mom always made a great zucchini bread, with walnuts, but I obviously had to add chocolate to it, after hearing about a zucchini/chocolate cake my mother-in-law was telling me about. I had to try it as bread first. With the help of cocoa powder, this bread turned out great. 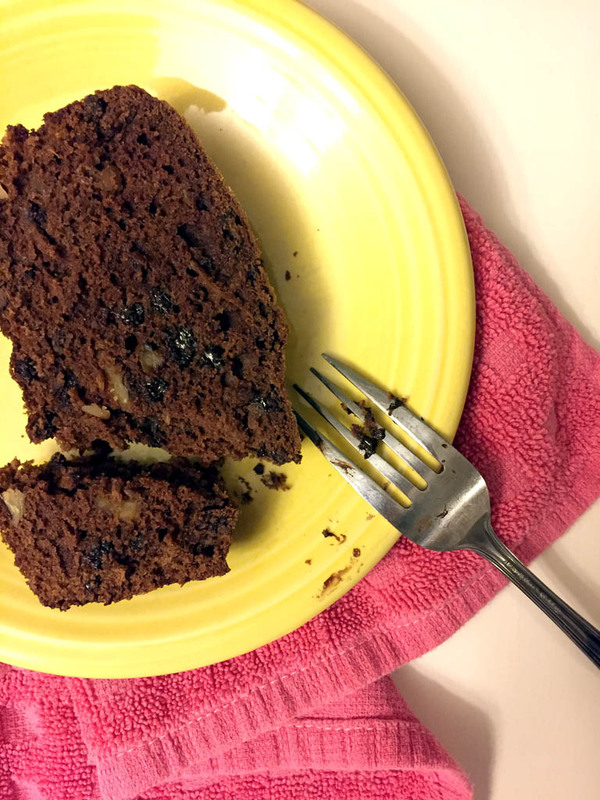 Chocolatey, zucchini-y, and moist. 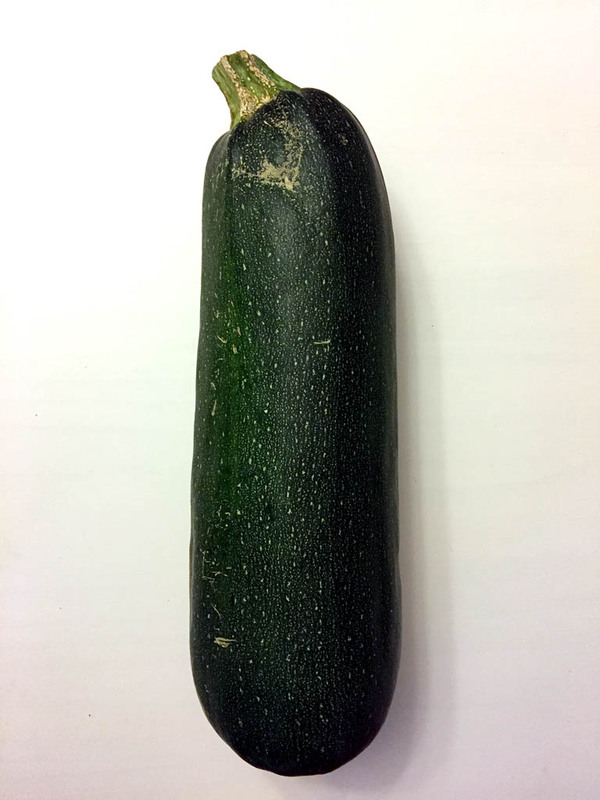 I made two, but I’m sure I could make 20 out of this giant zucchini! Grease and lightly dust the insides of 2 bread pans using a non-stick cooking spray and cocoa powder. In a mixer bowl, whisk 3 eggs until they become foamy. Mix in sugar, margarine, vanilla, cinnamon, salt, and zucchini. Divide batter between bread pans, and bake for 1 hour. Remove bread from the oven and allow to cool in the pans for about 10 minutes before inverting to cool completely. *Of course, nuts are always optional! If you like to have walnuts, but others in your family don’t, you can pour half of the batter in one bread pan, mix the nuts into the rest of the batter, then pour into the second bread pan.